BCA is holding a Classic and Historic Automobile auction at Blackbushe today, starting at 1.00pm with viewing from 9.30 this morning. 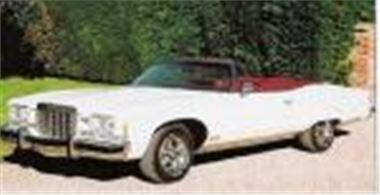 This 24,000 mile 1974 Pontiac Grand Ville caught my eye as I'm often asked about convertibles that will carry more than four people. Has a 455ci lump, so no worries about hauling its vast bulk along, though fuel consumption could be a small problem. Older true classic entries include a 1935 Morris 12/4 Series II Special Coupe with fake dumb irons, a 1927 Wolseley 16/45, a 1925 Rover 9/20 and a 1932 Triumph Super 8 tourer. Among the more modern 'classics' are a 1969 Bristol 410, a 1952 Morris Minor, a 1959 Alvis TD21, a 1966 Daimler 2.5V8, a 1958 Triumph TR3A, a 1966 Healey 3000 MkIII Phase 2, a 1969 Mini Cooper 1275S, a 1960 VW Karmann Ghia, a 1959 MGA Twin Cam, a 1968 Cortina 1600E, a 1959 Jaguar XK150 and a 1973 Triumph TR6. More info at www.classic-car-auction.co.uk, or phone 01252 877317.